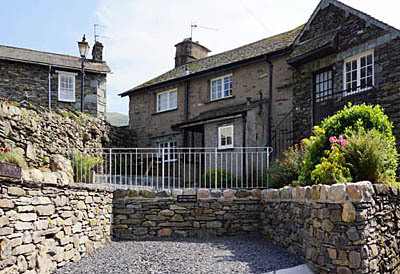 Ash Tree Cottage is in the centre of old Ambleside, a conservation area in a quiet slightly elevated position. It is two minutes' walk to all town centre amenities. The cottage is Grade II listed and dates back to c.1650, with original oak ceiling beams. It has been completely refurbished. There is parking for one car and a small patio with outdoor furniture for al fresco eating. The views are to the north across the town on to the fells towards Rydal. The ground floor comprises separate kitchen and a spacious lounge/dining area. 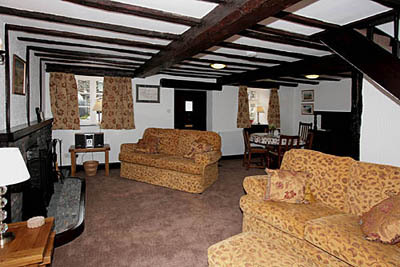 The lounge area is comfortable and tastefully furnished, with Freeview TV, DVD and stereo unit. In addition to the central heating, there is a coal fire with initial fuel supplied. The kitchen is modern and extremely well equipped with everything you’ll need for self catering. There is a fridge freezer, washer/dryer, oven and hob, microwave, also a dishwasher. Upstairs there are two double bedded rooms, a single room, and bathroom with wash basin, WC and shower over the bath. Weekly rates are £395-695 according to season. Changeover day is Friday. Rates include a welcome pack and freshly laundered bedding, towels and all utilities. Wi-fi is provided. The house is totally non smoking. For more information and for bookings, please go to our WEBSITE or email:enquiries@ashtreecottageambleside.co.uk , or phone 07985 771208.